As we ended our previous article, I had acquired a 1967 Jaguar E-Type 2+2 with some known mechanical problems, including inoperative brakes and a frozen clutch disc. I was working on getting these problems resolved. If you are going to spend any time working on a car, it helps to have some technical resources. 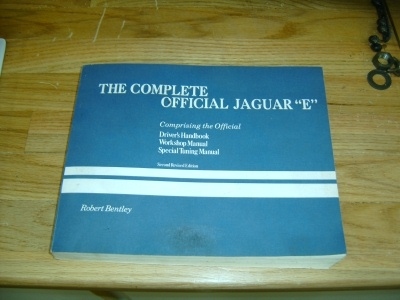 For the E-Type, the Robert Bentley company produced a very comprehensive shop manual. I love it because it’s such a throw back, with hand drawn details and pictures of mechanics in work jackets and ties. I bought mine on E-Bay, although they may still be available new. Haynes also makes a manual that appears to be fairly comprehensive. A web-based source for automotive books, including shop manuals and restoration guides is www.Motorbooks.com. With the internet, things have improved about 1000% with respect to obtaining information. I spend a lot of time reading postings at the E-Type forum at www.Jag-Lovers.org. This forum is very active and can be quite entertaining for daily correspondence with kindred souls who love Jaguars. They also have forums for the older cars such as the XK-120 through 150 and the newer series as well. Another very valuable feature of the forum is the ability to search their Archives. In this way, you can search on a key word like “brakes” and come up with a comprehensive list of postings that most likely will give you some in-sight into your particular technical problem. This is a very powerful tool. On weekends, it not uncommon for someone to post a question real-time regarding a problem that has come up for them and many times possible solutions will be posted right away. Another excellent resource is the website for our own national club at www.jcna.com. This website has a Technical area in which informative articles are kept which may be just what you are looking for. Another fairly active forum is maintained at the www.Classicjaguar.com website known as the Team CJ Cafe. Click on the CJ Cafe link on their home page. And don’t reject websites for other makes of cars as some of these can help a lot. Here are a few that I have bookmarked. There are just so many resources on the web that I never run out of things to read there about car restoration. In the case of my brakes, it was clear from my research that I would likely find corrosion in the bores of the master, slave, or wheel cylinders, that at a minimum would be causing leaks, and most likely the moving parts would be frozen in place. Brake fluid is hygroscopic, which means it attracts and mixes with water. 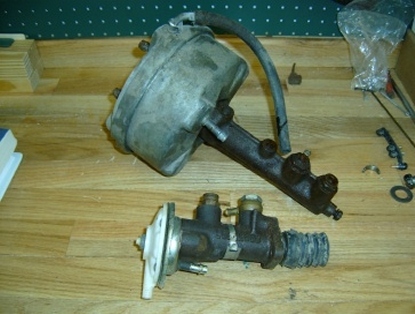 One result is that the interior of the brake hydraulic system becomes rusty. You can avoid this problem by changing out your brake fluid every couple of years. A silicone based fluid has been developed, registered as DOT 5, which does not absorb water. But do some reading before taking this step, as the DOT 5 fluid can cause leaks on older systems not designed for it. Personally, I’m going to stick with DOT 4 for now, with Castrol LMA being recommended. Sure enough, when I took off the front wheel cylinders on my E-Type, the pistons that were supposed to move in and out were frozen in their bores. I soaked them in PB Blaster for a while and then made up a fitting to apply compressed air at the inlet for the hydraulic fluid. This moved the pistons out to the point where I could get them out the rest of the way with channel lock pliers. And the bores were indeed very rusty. Several firms are out there that will machine a precise amount of metal out of the bore of the cylinder and then press in a “sleeve” that restores the inside diameter of the cylinder to it’s original specs. Its called re-sleeving. Apple Hydraulics and Sierra Specialties are two firms that have received favorable feedback on the Jag-Lovers Forum. But I decided to take a different route. I had read on the web that folks in the UK were adapting Volvo 240 calipers to the E-Type, as a cost saving measure. This appealed to me as I had a basement full of various Volvo parts, including some serviceable calipers. After communicating with several Jag-Lovers Forum members in the UK, I found that the bolt pattern on the Volvo caliper was almost an exact match to that of the E-Type. And the space between the brake pads was appropriate for the rotors used on the E-Type. One drawback is that, without modification, the inside of the caliper drags on the outside diameter of the rotor. The solution is to either reduce the diameter of the rotor or to remove some material from the caliper. I choose to remove material from the caliper. Finally, the Volvo caliper has two independent hydraulic circuits within the caliper. The guys in the UK break the caliper in half and drill a hole to connect the two separate circuits. I chose to connect the circuits using external plumbing. After many hours of work, including the installation of new rubber parts on my Volvo calipers, I was able to get the calipers mounted on the E-Type in a reasonable satisfactory fashion. Next I turned my attention to the master cylinder and the slave cylinder. I removed the master cylinder first, since it is positioned above the slave cylinder. I then went after the slave cylinder, which is much bulkier due to the integral vacuum booster unit attached to it. I was having a very hard time getting the assembly up through the opening between the firewall and the engine frame. After giving up, I resorted to tearing out the sheetmetal below the assembly, which was very rotten due to its position right under the battery and the inherent exposure to battery acid over the years. With both parts on the bench, I proceeded to tear them down. It was tough getting the internal parts out of the cylinders. Again, making up a fitting so that compressed air can be applied internally, forcing out the piston assembly, was the way to go. I was pleased to find that the bores of both the master and the slave cylinders appeared to be in pretty good shape. It looked like all I would need to do would be hone them. Hones are basically a set of 2 or 3 grinding stones that are set on a series of rods and levers that mount in a hand drill and spin. One places the hone inside the bore of the cylinder, starts the drill, and the grinding stones will polish up the inside of the bore nicely. 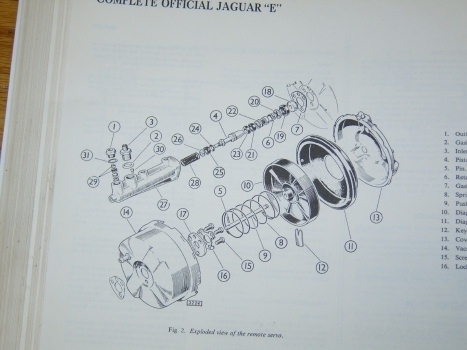 Based on discussions at the Jag-Lovers Forum, I selected Terrys Jaguar in Benton, IL as my mail order parts house of choice. I ordered rebuild kits for the master cylinder, slave cylinder, vacuum booster, and a new proportioning valve. At a minimum, rebuild kits for brake parts will contain the various rubber seals. Some kits contain additional hard parts. Installation of the various seals was straight forward. In this case, I didn’t disassemble the old parts until I had the new parts in hand. With the drawings and instructions that came with the kits, I was able to get the two cylinders back together. The vacuum booster is a slightly tougher job, only in that a special tool must be made to get the cover off. In my case, I had some scrap angle available, into which I drilled two holes the correct distance apart. The holes engage 2 of the 3 bolts extending from the end of the booster case. Clamp the booster in a solid vice and expect to pull pretty hard to get it loose. As usual, a little PB Blaster helps loosen things up. The key part internal to the vacuum booster is a rubber diaphragm. This diaphragm must be free of holes. Additionally, it must form an airtight seal, both at its center where the brake actuating rod passes through and at its perimeter, where it is clamped between the two halves of the booster housing. The booster unit bolts directly to the slave cylinder. One common fault is a failure of the outermost seal in the slave cylinder that allows brake fluid to seep by. It collects in the near half of the booster unit. So if you find that you have to keep adding brake fluid to your fluid reservoirs yet you can’t find any evidence of where it is going, such as leakage at a wheel cylinder or a fluid saturated carpet in the footwell, you may be “collecting” fluid in the booster unit. Eventually, the unit will become so full of fluid that it will cease to operate! Next month we’ll talk about the operation of the proportioning valve and a subtle problem that I discovered that led to my brakes totally locking up.